The Food and Agriculture Organization has some good news and some bad news for us about the world’s fisheries (State of the World Fisheries & Aquaculture Report). The good news is that global fisheries and aquaculture production increased over the last few years, and people are eating more fish – a healthy source of protein. The bad news is that ocean fish catches went down and the percentage of the world’s assessed fish stocks that are overexploited or fully exploited went up to 87%. 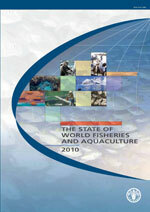 Aquaculture, the farming of fish, is increasing rapidly to meet growing consumer demand for seafood. While some aquaculture production operations have small environmental footprints, the sustainability of the industry overall is unknown. What does it mean for ocean productivity and the health of ocean ecosystems to remove 15 million tons of fish (19% of the total catch) every year and feed it to other fish?